We’ve got a good one for you – how to do no heat curls. I have before you 3 different ways you can fix your hair at night so when you wake up you have beautiful curls in less than 5 minutes. Apply makeup & you’re done. Yep. What, you don’t believe me? It’s true, ladies. And to make it easy for you, I have put them all together in this post, with a video including all three. It works for me every time and have heard others love it as well. It really is worth giving a try! That took me absolutely no time at all and I have straight hair. And guess what the added bonus is? They last all day. I get more compliments when I wear my hair like this than when I sit for an hour and curl it. Compliments like “oh my gosh, what did you do to you hair? I love it!” and “how long did that take you?” Well, here’s what I did: I woke up this morning. The next trick gives you a big of a funkier feel, but if you are like me and like funky, big hair from time to time, this one is perfect. Specially for the summer when messy, crazy and effortless is totally ‘in’. This is called ‘no heat: little buns.” You will see why in the video. If you want to skip to this section, it starts at 4:45. This last look is the simplest for the night before but the outcome is still wonderful. It gives a beachy waves type feel and at the very least it gives you a great base for some other styles. To finish this look off, all you need is a 3 barrel curling iron just adding a bit at the roots. If you just want loose curls you can try adding a few beachy curls with a one inch curling iron. I have a tutorial for this type of beach curl here. If you want to go directly to this tutorial in the video it starts at exactly 8 minutes! I added the dutch braid in front for a different look, but you get the idea. Like I said this can be a great base for a lot of different looks. And now I put together a little tutorial for your benefit, so you can see more specifically how it works. I hope you enjoy it! And seriously, this is the best thing that has ever happened to my hair/getting ready regime. It’s incredible. 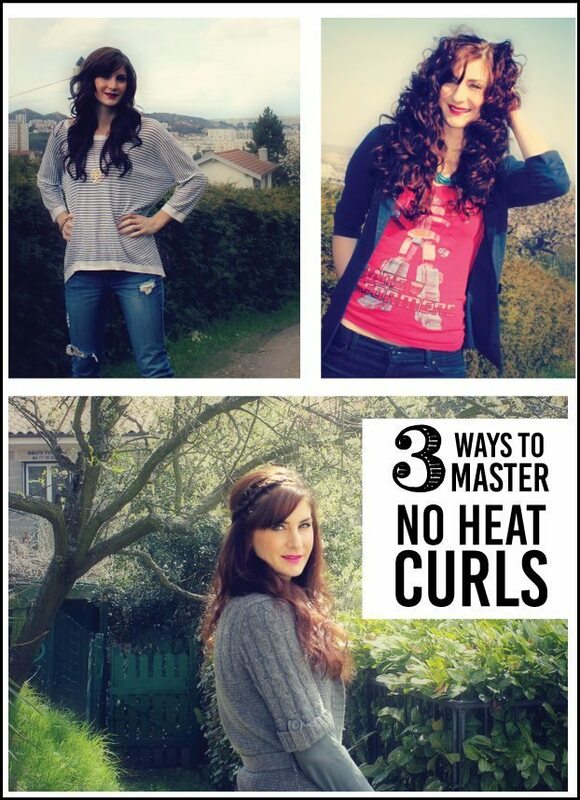 Just in case you want to jump to a particular tutorial, No heat curls with a headband is first up. Go to 4:45 to see no heat – little buns. Go to 8:00 to see the braid. Thank you so much for reading, and seriously, give them a try! Specially during summer when the last thing you want to do is bust out a curling iron! Love the tutorial – will have to try the headband trick to see if it works on my shorter hair. Random question – what music do you have playing in your video…I love it! Although I remember the first time I tried it, I made about 5792879435943759837 miniature buns out of super-thin sections of hair and ended up with dreadlock-y ropes! HA HA HA! Oooh this is great! You look gorgeous (and I’m totally digging that countryside behind you). I haven’t done no-heat little buns since college! I love this tutorial thank you! I have to say I do something similar every day/night and it works wonders! also if you forget to do it the night before just put it up, heat with a hairdryer until as warm as you can stand it and leave it for as long as you can (I find i can achieve this look in under 30 minutes) and this is also a great way to prevent your hair from getting too heat damaged! You’re looking gorgeous. Don’t blame people if they thought you as teen in that Transformers shirt! Thanks for that video tip.